Propnomicon: Cthulhu Fhtagn! Temir7 Edition. 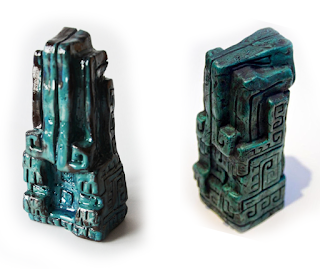 Temir7 brings us this Mesoamerican-style Cthulhu idol in fired ceramic. From a scholarly standpoint I think it's interesting for being blue-green instead of the iron oxide palette of red-black-brown found in the majority of surviving South American ceramics. Update: Imitation is the sincerest form of flattery. Credit goes to bea in the comments for recognizing how similar Temir7's piece is to the excellent work of Fox Henderson. This surely isn't coincidental. I sincerely hope it's merely a case of forgetting to include a mention of what inspired this version. 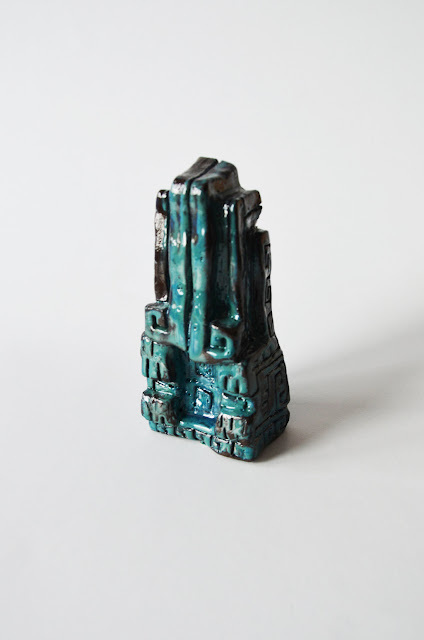 That’s a nice piece of work and I like the execution and the turquoise glaze. The great thing about ceramics is that it can survive for thousands of years under the right circumstances. Imagine ten thousand years from now this little goodie turning up at a dig. Long after the faux Necronomicons are dust, the Cthulhu plushies have disintegrated and even our dice crumble, it will live on. Imagine it sitting on a crystal pedestal under a force dome in a museum, “Middle Holocene Period Figure, Vitrified Clay, North Continent.” I went to Tamir7 Deviant Art gallery and was pleased to find a wide variety of endeavors. Propnomicon make a good observation about finishes. Precontact new world pottery can show a tremendous command of plastic technique and often have a high level of artistry both the abstract and representational. But they simply did not have fired glazes as we know them. They painted the finished, fired objects and they were not fired again as the pigments would burn off. Their works were open fired or placed in a fire pit, but they didn’t have kilns, which allowed for careful control of temperature and environment as well as higher temperatures, with very few exceptions. Glazes are applied at a second, or even third firing. Despite the difficulties inherent of these traditional types of techniques, some native American craftsmen produced finishes (such as burnishing) and painting that are some of the finest seen. It is pretty close to my original piece, just different proportions. I'll take it as a compliment though and assume, as was pointed out in the post, that crediting me was just an over-site and this wasn't intended as "rip off". I'm sure someone has accused me of copying designs at some point, even though I try to avoid it at all costs. Yes that does bear a remarkable resemblance to Fox Henderson's (aka The Monkey Rodeo) version "Mayan Cthulhu Totem", even down to the colors & symbols used. Perhaps the person who did this version forgot to give Fox credit? You're very gracious. On the bright side, you know you're doing something right when people are copying you. I'm not mad in the slightest and don't see any reason why I should be. As you said, you made it for yourself, I think you'd be hard pressed to find any artistic/creative type that hasn't done that at least once, if not for practice, but just to put their own spin on it for themselves. I totally understand and appreciate where your motives to do this came from. I think because stealing designs and offering them up for sale has become such a huge thing right now (especially in prop replica and cosplay), you have to be really careful about what you post and how you present it. Even something totally innocent, like in this case, can be taken the wrong way and cause a lot of backlash if not handled properly. I'm still waiting for the day I'm randomly accused of something like this. I'm very happy to hear this was a simple oversight. Your considerate apology is much to your credit. That said, I'd love to see more from your game. Again, you are exceedingly gracious.